The book, Rethinking the Green State, conducts a systematic comprehensive analysis of the ideals and practices of the evolving green state. It draws on elements of political theory, feminist theory, governance and institutional theory to conceptualise the green state and advances thinking on how to understand its emergence in the context of climate and sustainability transitions. 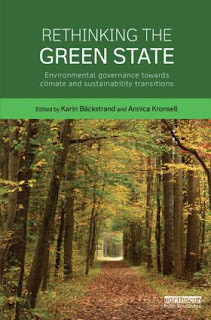 Focusing on the state as an actor in environmental, climate and sustainability politics, the book explores different principles guiding the emergence of the green state and examines the performance of states and institutional responses to the sustainable and climate transitions in the European and Nordic context in particular. Annica Kronsell, an editor of the book, is a member of the GUST team.